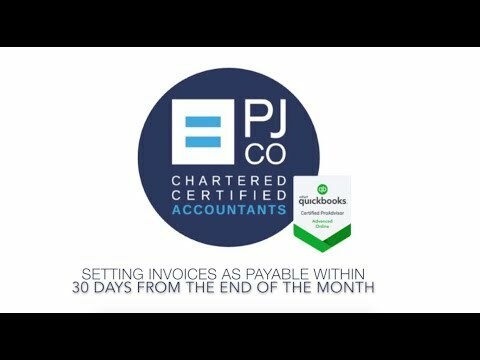 A recent client of ours asked us if it were possible to create terms for an invoice that would allow them to make it payable 30 days onwards from the end of the month the invoice was raised. For example: creating conditions where an invoice made on 07/05/18 would instead be due on the 30/06/18 as opposed to the 31/05/18. 1. Firstly, go into your QuickBooks account and select ‘Account and Settings’ found under the ‘Company Cog’ in the top right corner. 2. Navigate to the ‘Sales ‘option on the left-hand side, click on ‘Sales form content’, select the drop-down menu option to the right-hand side of Preferred invoice terms’ and then select ‘Add new’. 3. As seen below, start by entering in the correct name for the term you are using, which in this case would be ‘30 days from the end of the month’. 4. As you want the invoice to be due by the last day of the month, select the option ‘Due by certain day of the month’ and enter ‘31’ into the first box. 5. As you want the invoice to be made payable 30 days after the due date enter ‘30’ into the box named ‘Due the next month if issued within’. 6. Finally, it will give you the option to apply a discount if the payment is made early which you may enter if you offer such terms, otherwise click save. Now, whenever you create an invoice, under the ‘Terms’ drop-down menu it will give you the option to select the new term you have just created making it possible to make the amount payable 30 days from the end of the month. Watch my YouTube video for further help! Expert UK-based QuickBooks Online Support - 01273 441187 Learn how to set invoices as payable within 30 days from the end of the month in QuickBooks Online. Find Matt at https://proadvisor.intuit.com/app/accountant/search?searchId=matthew-lay on QuickBooks Find an Accountant Tool! Do you have any good tips and tricks for invoicing? 1) Work from left to right, top to bottom ensuring all information is correctly entered. 2) Be sure to use a invoice number so that you can easily refer back to it at any time by entering it into the search bar. This is a great tool and can save a lot of time! 3) Be sure to add your payment details in the display box so that existing and new customers know how to pay. 4) On creating your invoice template, there are 3 custom invoices boxes that you can use, show below as 'Custom field x' and they allow you to enter specific information for different or regular customers. For example a garage would possibly use these custom fields to enter registration details for the vehicle they're working on which could later be used for future reference. These custom fields cannot be entered into the search bar, however they prove useful when sorting through invoices where it makes it clear as to what each invoice relates to. 5) Select the correct terms for the invoice. As discussed in the above article, if you wish to make your own terms you would follow the same process but adjust the terms accordingly. 6) Finally I would recommend customising your invoices via the 'customise' function found at the bottom of the page when creating an invoice (or found under the company cog under 'custom form styles'). This will give you the option to select and change a variety of features (as seen below) to give your invoice a more personal touch! These are brilliant tips. I love the idea of the customising! This is something I use to make my own invoices stand out, I use the colour function in particular. Really helpful, thank you Matthew! I hope you're doing well! Are you prepared for the cooler months? How's business?